One of the biggest failures of the United Nations (UN) since its founding was its inability to halt the nuclear arms race and take any significant step towards elimination of nuclear weapons. On the contrary, the UN – wittingly or unwittingly – became a victim of a series of con games played by the nuclear weapon powers. On the face of it, the latest attempt of the UN to adopt a so-called ‘Convention on the Prohibition of Nuclear Weapons’ appears to be no different. This analysis is an attempt to suggest ways and means to prevent the proposed ‘Convention’ from becoming yet another con game. As far as the Comprehensive Test Ban Treaty (CTBT) is concerned it may be recalled that it was the first item on the agenda of the Eighteen Nation Committee on Disarmament (ENCD) that was set up by the UN General Assembly way back in 1962. However on the eve of finalizing the CTBT, three nuclear powers – namely, USA, USSR and UK – decided to sign a Partial Test Ban Treaty (PTBT) on August 05, 1963, which permitted underground nuclear tests while banning nuclear tests in the atmosphere, underwater and in outer space. Signing the PTBT was a betrayal of the cause of disarmament and peace. Yet most nations of the world, as well as the peace movements, welcomed it without understandings the repercussions of supporting the PTBT and the adverse impact it would have on the long run. Similarly, peace movements were enamored by the form of the CTBT than its contents and willingly supported its adoption in 1996. However, the fact is, the CTBT is just another ‘too clever by half’ proposal of the U.S., through which it intended to outwit other nations. This is evident from the statement of Dr. Sigfried Hecker, former director of Los Alamos National Laboratory, who let the cat out of the bag by his boastful statement in 2009 that: “the single most important reason to ratify the CTBT is to stop other countries from improving their arsenals.” [Emphasis added] In other words, the CTBT does not in any way restrain the U.S. from improving or upgrading its nuclear arsenal! In short, “the Comprehensive Test Ban Treaty purports to ban an activity it does not define” as was pointed out by none other than Republican Senator Trent Lott, the majority leader in the U.S. Senate, on October 5, 1999. Therefore, nobody knows whether the so-called low-yield hydronuclear tests, zero-yield nuclear tests, hydrodynamic experiments, subcritical experiments, etc. – all intended to develop/upgrade nuclear weapons – are banned or not. However, the fact is, USA, Russia, U.K., and China have conducted hydronuclear tests after the signing of the CTBT. The U.S. has also reportedly carried out 27 subcritical critical experiments with plutonium since 1992 at the Nevada Test Site. Moreover, according to a news report dated April 16, 2017, the U.S. successfully tested an upgraded version of the B61-12 nuclear bomb by dropping a zero-yield version of the bomb over the Nevada desert. In short, the CTBT, in its present form, has not imposed any restrictions on the nuclear weapon development capabilities of the P-5. Instead, the CTBT was designed as a non-proliferation tool to rein in the NNWS and to maintain the status quo. It is quite obvious that the CTBT, in its present form, was not intended as a step towards the goal of nuclear disarmament. As far as the U.S. was concerned, CTBT was just a cover for outwitting the other members of the P-5 and other NWS. 3 That such disarmament is accompanied by the establishment of reliable procedures for the peaceful settlement of disputes and effective arrangements for the maintenance of peace in accordance with the principles of the Charter of the United Nations. 4 The programme for general and complete disarmament shall ensure that States have at their disposal only such non-nuclear armaments, forces, facilities, and establishments as are agreed to be necessary to maintain internal order and protect the personal security of citizens; …. Since the world was faced with the menace of nuclear weapon tests (especially atmospheric ones) during the early 1960s, deliberations at ENCD focused attention on arriving at a test ban treaty as the first step towards nuclear disarmament. However, on the eve of signing a comprehensive test ban treaty, USA, USSR and UK decided to sign a Partial Test Ban Treaty (PTBT) on August 05, 1963. With the signing of the PTBT, the powerful worldwide peace movement against nuclear weapons almost dissipated on the mistaken belief that the danger posed by nuclear weapons had been averted. Moreover, with the assassination of President Kennedy on November 22, 1963, and the untimely death of Prime Minister Nehru (the architect of NAM) on May 27, 1964, the issue of general and complete disarmament practically disappeared from the agenda of the peace movement. Thereafter, discriminatory treaties such as NPT, NWFZs, CTBT, etc., have been dominating the scene for the last five decades, without having any impact on either reducing the threat of nuclear war or advancing the cause of general and complete disarmament. Of course, between 1963 and 1975, the peace movement was totally immersed in the campaign to oppose USA’s aggressive war against Vietnam. It was only when the U.S. began deploying neutron bombs in Europe in 1977, that the peace movement again began focusing attention on the impending threat of nuclear war. Concurrently, as a result of the initiative taken by the NAM Summit in Colombo in 1976, the UN decided to convene a Special Session of the General Assembly Devoted to Disarmament (UNSSOD) in 1978, which was followed by two more UNSSODs in 1982 and in 1988. At the 1988 UNSSOD, Prime Minister Rajiv Gandhi submitted India’s ‘Action Plan for Ushering in a Nuclear Weapon Free & Non-Violent World Order’, which was an attempt at resurrecting the essence of the McCloy-Zorin Accords of 1961. Unfortunately, after the demise of the Soviet Union in 1991, the peace movement has suffered a setback due to the mistaken belief that the nuclear danger had waned. The fact that the UN has been unable to organize a fourth special session on disarmament during the last three decades, despite the turbulence and discord in many parts of the globe, is a matter of grave concern. It is an indication of the kind of ideological influence under which the UN is being forced to function. Declare that the use or threat of use of nuclear weapons would constitute a crime against humanity. Ban on introduction of new types of weapon systems; etc. Highlight the fact that nuclear weapons cannot protect life in any way; its use either through a preemptive attack or through a retaliatory attack can only cause widespread death and devastation. Finally, a genuine Draft Convention on Prohibition of Nuclear Weapons will have to be based on the McCloy-Zorin Accords (i.e., the U.S.-USSR Joint Statement on Agreed Principles for Disarmament Negotiations) of 1961 and it will have to incorporate the essence of Rajiv Gandhi’s ‘Action Plan for Ushering in a Nuclear Weapon Free and Non-Violent World Order’ of 1988. In addition, it should have enough inputs from the revised ‘Model Nuclear Weapons Convention’ submitted by Costa Rica and Malaysia to the UNGA in 2008. On the contrary, if the Draft Convention is essentially only a cover to infuse faith in the present NPT, it will tantamount to yet another act of deception and nothing else. The NPT in its present form is nothing but a fraudulent treaty: it is just incredible that the P-5 could claim inalienable “right” of use of nuclear weapons against the very signatories to the treaty and the NNWS meekly conceding that “right” to the P-5! Had the NPT been a non-discriminatory one, it would have indeed severed the purpose for which it was intended. 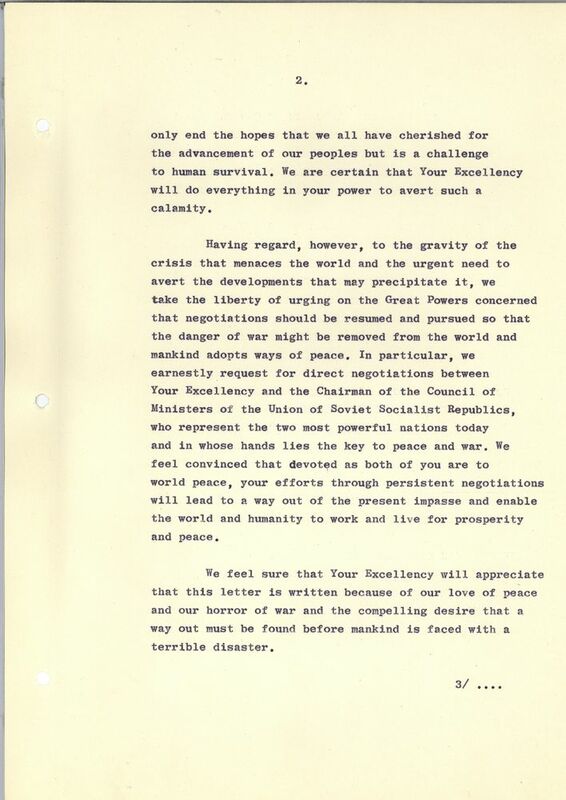 The Stockholm Appeal for banning nuclear weapons issued by the World Peace Council (WPC) in March 1950; Prime Minister Jawaharlal Nehru’s call before the Indian Parliament on April 02, 1954 for a ‘Standstill Agreement on Nuclear Weapon Tests’; the appeal for disarmament and peace issued by the Bandung Conference on April 24, 1955; the Russell-Einstein Manifesto of July 09, 1955 about the dangers posed to the survival of humanity; the formation of the Japan Council against A & H Bombs on September 19, 1955; the formation of the Campaign for Nuclear Disarmament (CND) in Britain in February 1958; and similar organizations in several other countries had succeeded in arousing the consciousness of hundreds of millions of people across the world about the dangers of nuclear war and the need for abolishing nuclear weapons. However, following the signing of the PTBT, there was drastic drop in the membership of most of the peace organizations. However, after the assassination of Rajiv Gandhi on May 21, 1991, successive governments in India, other than paying lip service, have done little to advance the cause of disarmament and peace.